Qweenapps - Every bit counts. 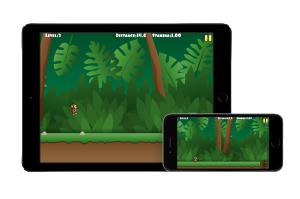 Meet our newest game: Monkey Run. It is a free adventure game for iPhone and iPad. As the name suggests, the monkey runs; runs for the bananas to have the strength and energy to bypass the traps on the road. Not much skills are needed to play this game. 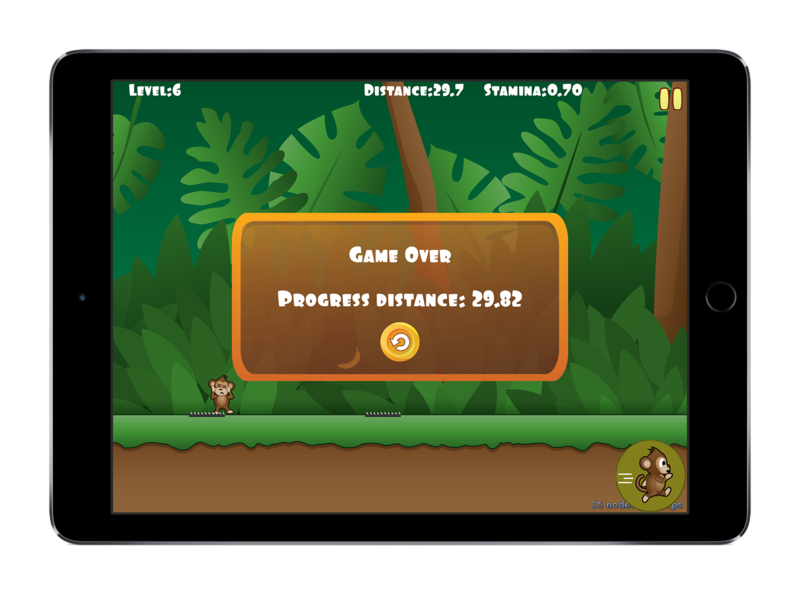 Simply be careful and jump with the monkey when needed. Beware of the speed of the monkey! Some traps need full speed to be bypassed, while for others you might want to slow down a bit. If the monkey goes into the trap, the game ends. But don’t worry, you can try again as many times as you want. Make sure that you run as much as you can if you want to win the marathon. The longer distance you run, the more points you get. You can track your high scores in the Game Center. Unlock the achievements and stand out from the crowd. Challenge your friends and let yourself be challenged by others. If the adds are bothering you too much, you can get the ad-free version for a few cents. We hope you will enjoy this game! 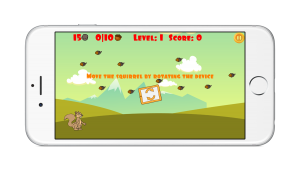 Squirrel – The Nut Hunter is an adventure game for iPhone and iPad devices. It is a bit different from our latest released ones. 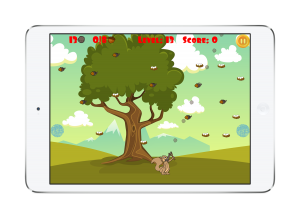 No puzzle this time, but an adventure game about a squirrel that is hungry and wants to eat some nuts. 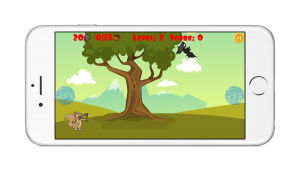 Help our squirrel hunt down the nuts: from the trees, sometimes from birds or even from stealing birds. This is a simple game with a basic goal: the squirrel has to shoot down with its’ slingshot a number of nuts (and also eat them) to pass a level. Beware, it is not very easy to do this. Sometimes all the nuts have to be eaten to be able to get to the next scene. At some levels time is your enemy! The squirrel can be moved either by moving your device either by tapping on the buttons on the left and right. You can get in the shooting position by simply tapping near the squirrels’ tail. At that point, it will get its’ slingshot ready with a rock, and now it is up to you and your aiming skills to shoot down the nuts. If these skills are not that good, you can unlock the ghost targeting option which will help you guide the rock. If you get expert in shooting and don’t need it any more, you can simply turn the option off. 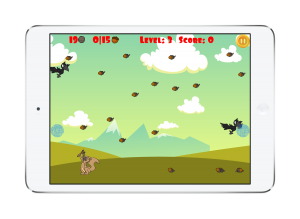 It is a free game which contains 16 fun levels with different goals. You have to pass the actual level to be able to get to the next one. Unlike cats, this squirrel has plenty of lives (as nothing is actually harming it), only the number of rocks for its’ slingshot is limited. 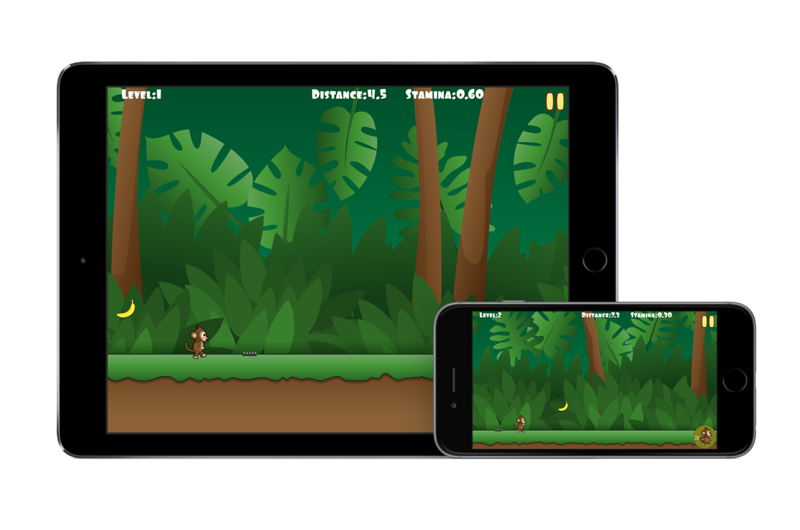 For some levels you might want to be patient, and for some you have to really hurry and shoot precisely. P.S: No birds were harmed in the making of this app. Are you ready for our next challenge? 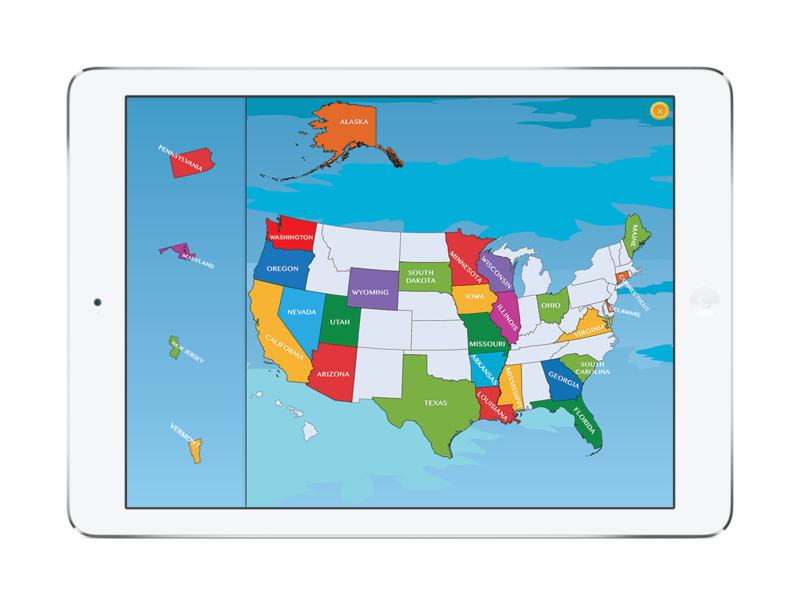 If yes, check out our new app, the U.S. puzzle game for iPad and iPhone. The U.S. puzzle game is an educational game for everyone who wants to learn more about the states of the United States. 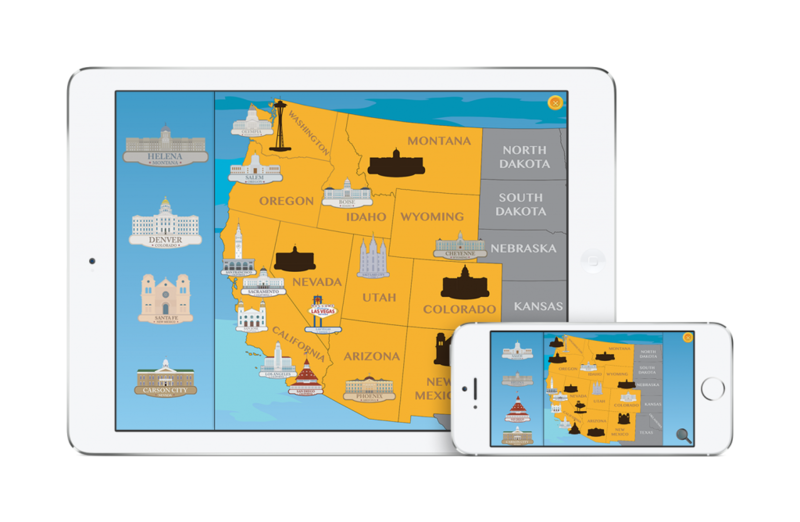 It doesn’t matter where you live, if you are American or Asian, it is always good to know where Kansas or Montana is, what are the major cities of the Idaho state or whether Indiana is bigger than New Mexico. 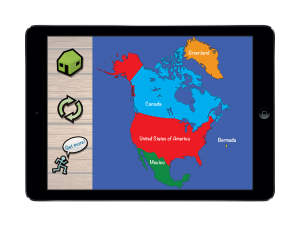 The game consists of 5 free puzzles, all about the North American country. In the first puzzle, you have to put the states of the U.S into their right place. It is a good exercise to learn more about the size and the geographical location of each state. The second puzzle is about The West. 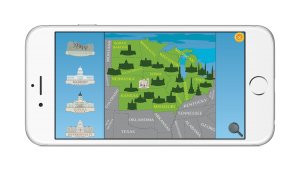 You need to find the right place for each city/capital for the western states of the country. And you don’t get just the name of the city! You have a picture of some specific building of the city. For example, you get the Las Vegas very well known welcome sign, or the Seattle tower. The shadow for each of this building can be found on the map, so it is not that hard to find the place of the city. 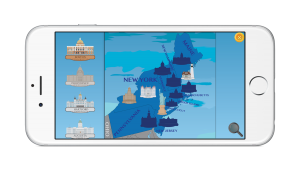 Also, the location of each city is more or less correct (considering that we needed to put the building on the map, and not just the city name). After you mastered The West, you can move on to The Mid-West. 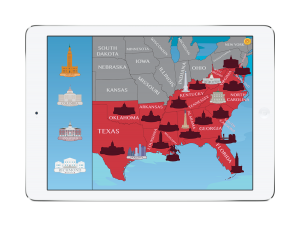 The challenge is the same, just the states are different and, of course, their capital/major cities. The last two puzzles are The South and The North-East. In the last one there are fewer cities, but beware of the tiny states of that region! The good news is that the whole app is free! If the occasionally appearing advertisements disturb you, you can play ad-free for as little as 0.99$. 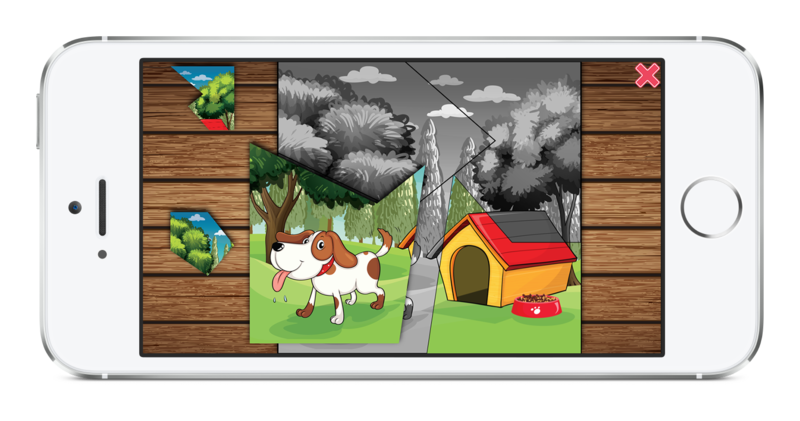 The puzzle is available for iPad and iPhone, we also support the latest IOS. For iPhone, you have the zooming option which makes it easier to find the right place for the cities/states. 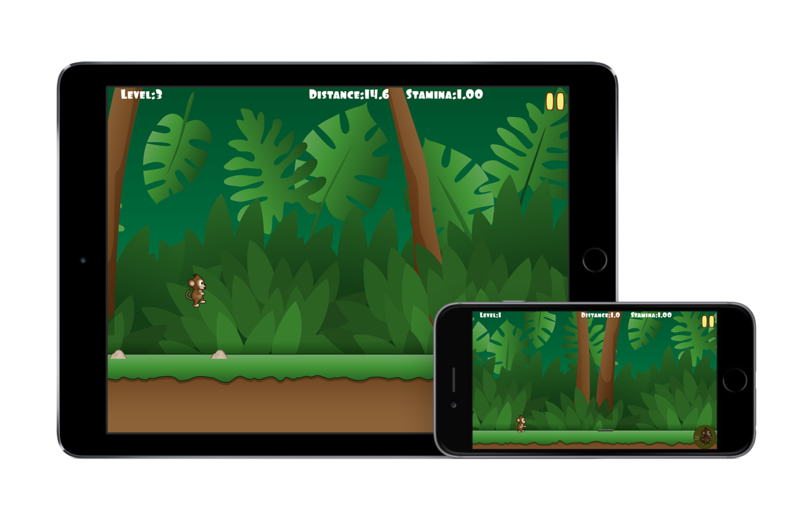 This way, the game is as enjoyable on iPhone as it is on iPad. 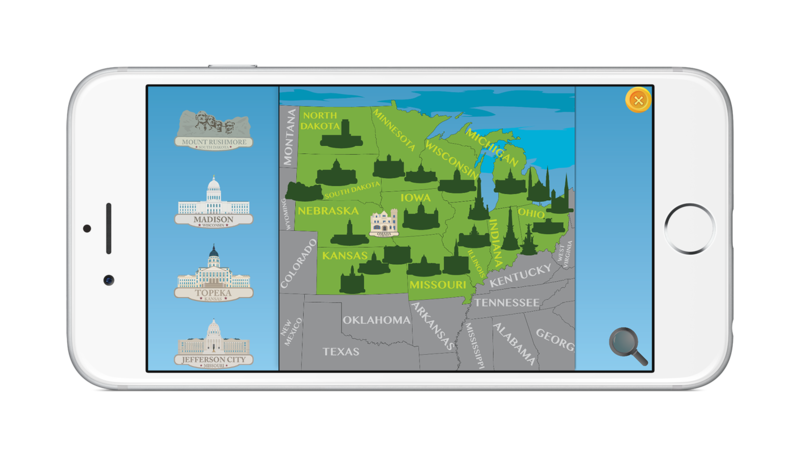 We hope you will enjoy the first version of our new game and will learn a lot more about the United States. And don’t forget to rate us! Can you finish the Europe puzzle? 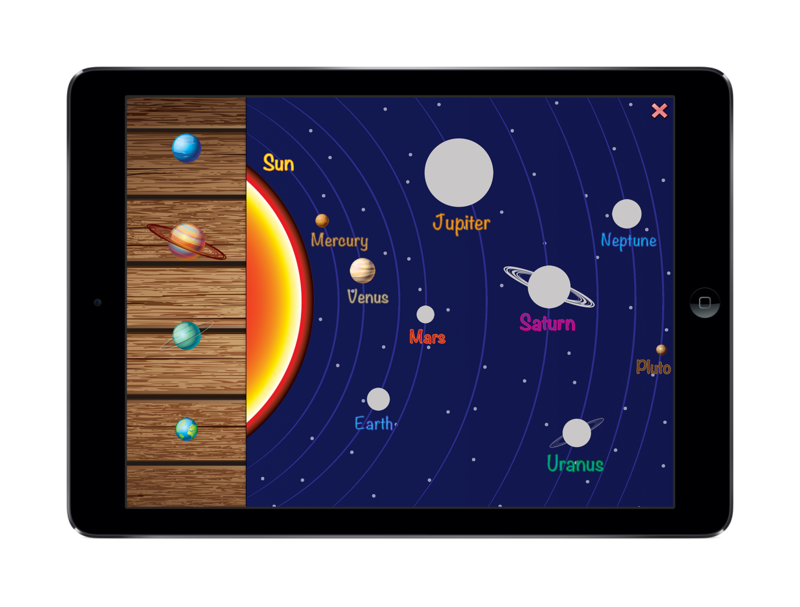 Let’s put our Earth together with this new educational puzzle game we just developed! Our world is so beautiful and we know so little about the countries of our neighbouring or even our own continents. 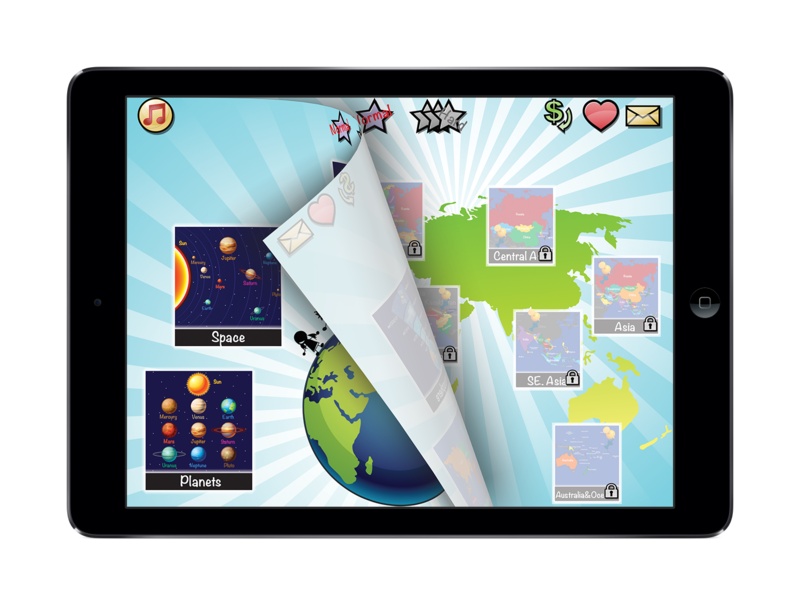 This made us build this puzzle game, which starts from the outer space and after a while you will find yourself at the opposite side of the World. 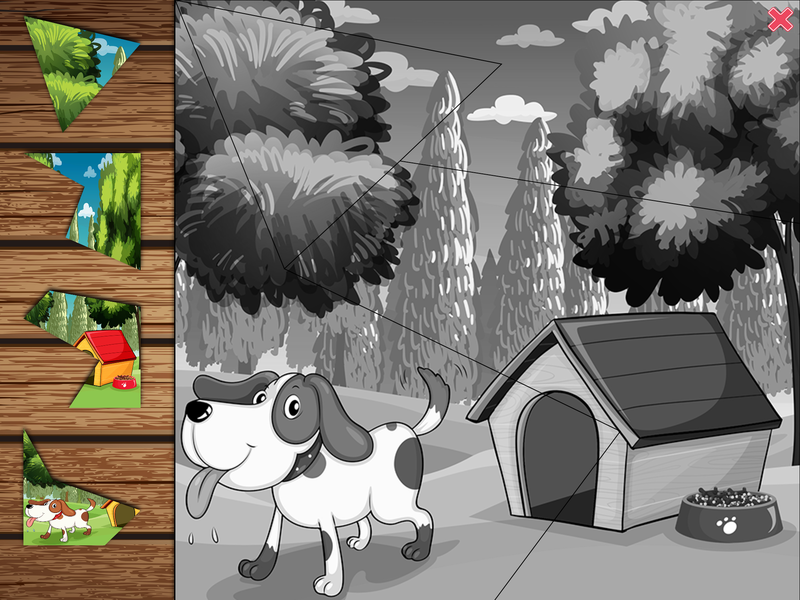 The puzzle was specially made for iPad/iPhone devices and includes 2 set of games. The game is for everyone who wants to learn more about our world. 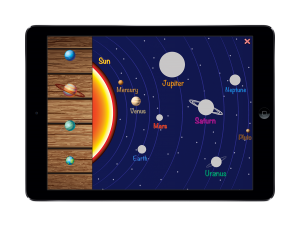 You will get interesting information about planet Earth and other planets you might have forgot since geography classes, like the planets and their place from the Sun, the layers of the atmosphere or the distance between the Moon and the Earth. The last piece of puzzle from this set will get you ready for the next challenge, the second set of games, which includes 13 puzzles of maps. Definitely you heard about this, when people were asked to fill the country names on an empty map. It is hard, isn’t it? 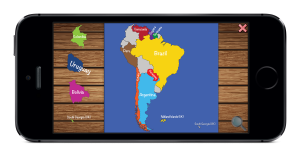 Playing our fun puzzle game you will get to know the American continent: North America, Central America, South America and the Caribbean islands. But this isn’t all. We challenge you to put European countries to their right places! If challenge accepted and wish to learn more about our amazing World, you can solve Africa. 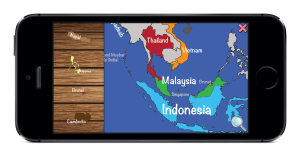 Asia, being big and consisting of many little countries, is divided into the Middle East, Central Asia and South-East Asia. 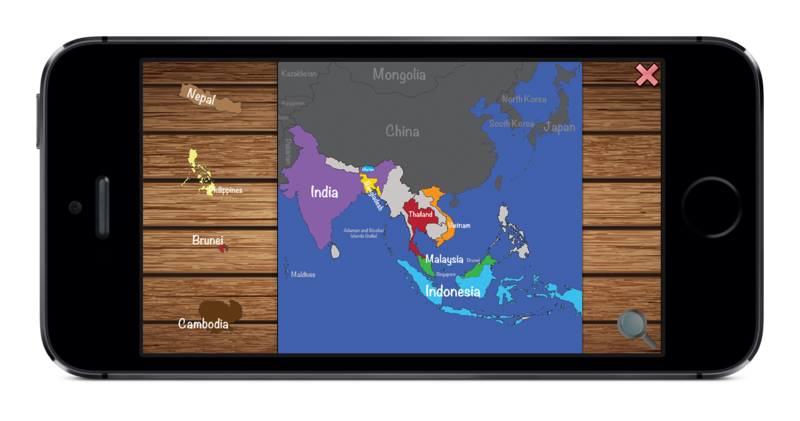 We included the entire Asia as well, if you want to see the big picture. After Asia, you can move to Australia and Oceania, including a big part of the small islands we all wish to visit one day. 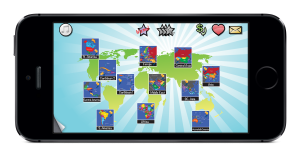 Unfortunately we could not make this educational game fully free, as we have invested a lot of time and energy in all those countries you can just drag and drop. But, the good news is, the first set of puzzle is completely free. From the second set, you have only North America granted, but the rest can be unlocked for a few bucks. As mentioned earlier, the game is available for iPad and iPhone! 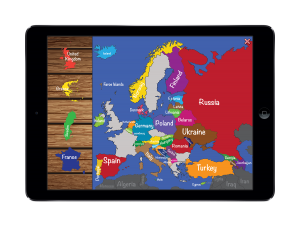 In the iPhone version, you have the zooming option of the map, as some countries are really small. 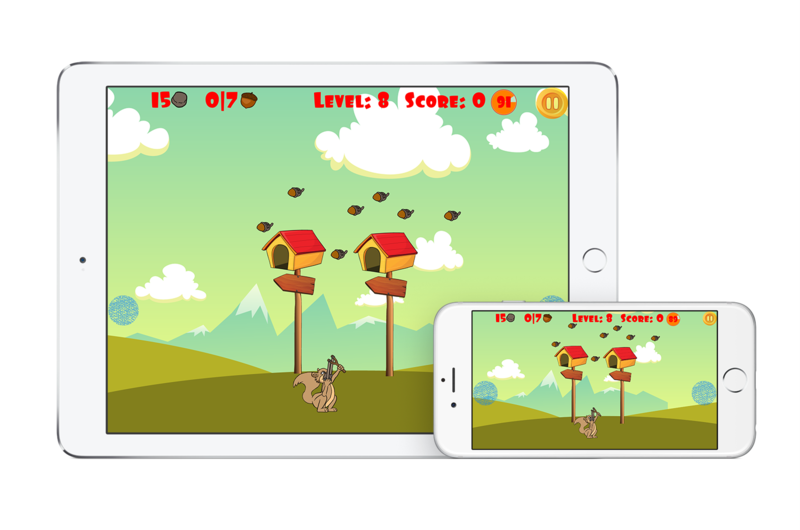 In this way, you can enjoy the game on iPhone as much as on iPad. The game has two difficulty levels: normal and hard. In the normal mode the country borders are visible, so matching the shapes is easier. 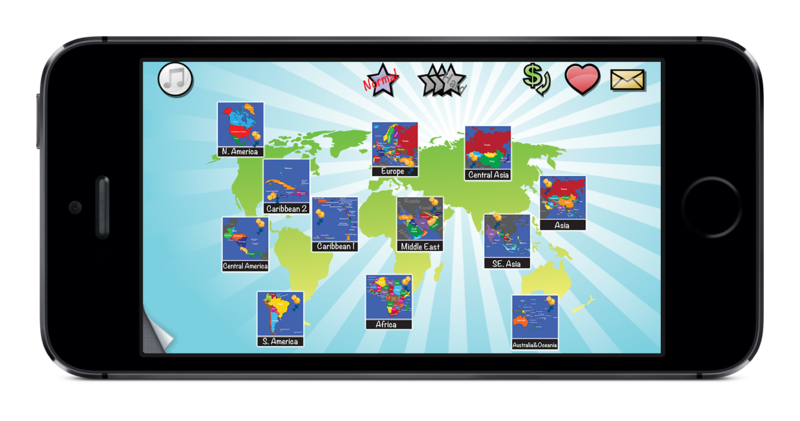 If you are a geo expert, you can start playing the game on the hard difficulty level, where the borders of the countries are not drawn. 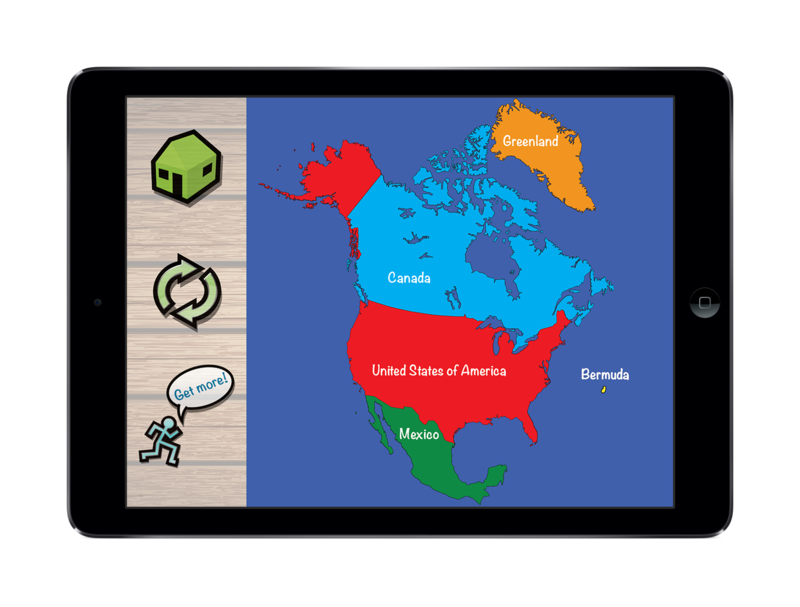 All in all, the “Our World Puzzle” is a nice, educational and challenging game you should definitely try even just for fun. …and don’t forget to rate us, we really appreciate it! Good news! An update of the Toddlers Puzzle is available now to download from the App Store. What we did in this new update? First of all, now it is available for iPhone as well. We understand that not everyone is running around with an iPad, and maybe an iPhone can be handier in some situations. So here we go. It includes a few optimisations on the pictures’ quality. Just take a better look, either on the free ones (yes, some of them did change) or the in-app purchased ones. If you have a retina iPad, you can surely see the difference. 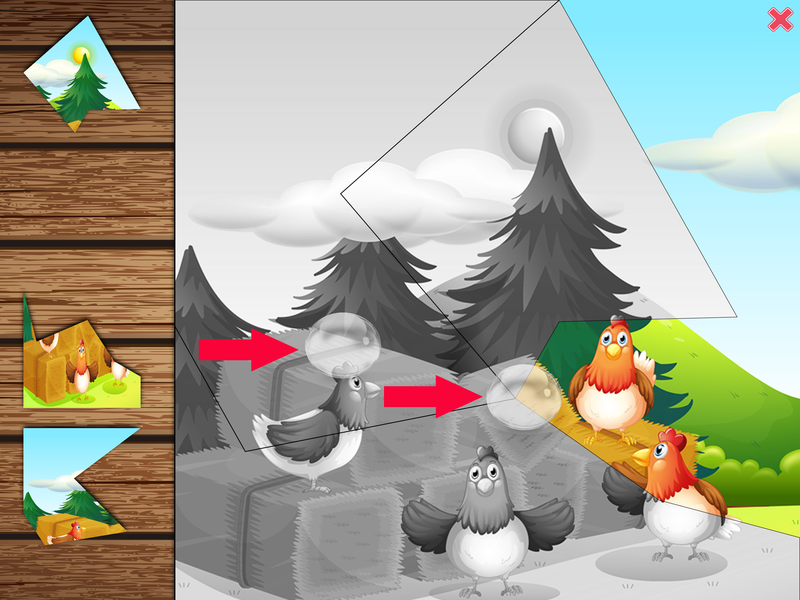 Other than this, we added 2 more shapes for the puzzles. If you are attentive enough, you will notice them. And your kid will do as well. Memory optimisations were included in the update package. If previously you had problems like sudden exit of the app after a few hours of playing, now you won’t. 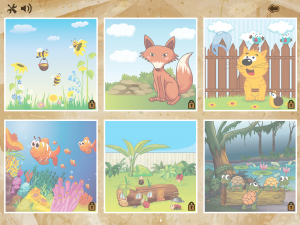 What will be also nice for your toddlers, is the new music we added. Now there are 2 full tracks your kid can enjoy while playing. 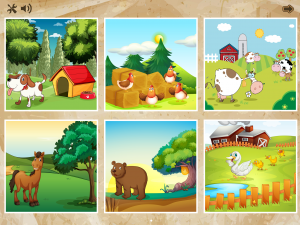 All in all, if you have a toddler who likes puzzle games, and you want them to see nice animal pictures and to listen to loveable music while playing, try our puzzle. It is enjoyable! In the meantime, we will create your kids’ next favourite game. 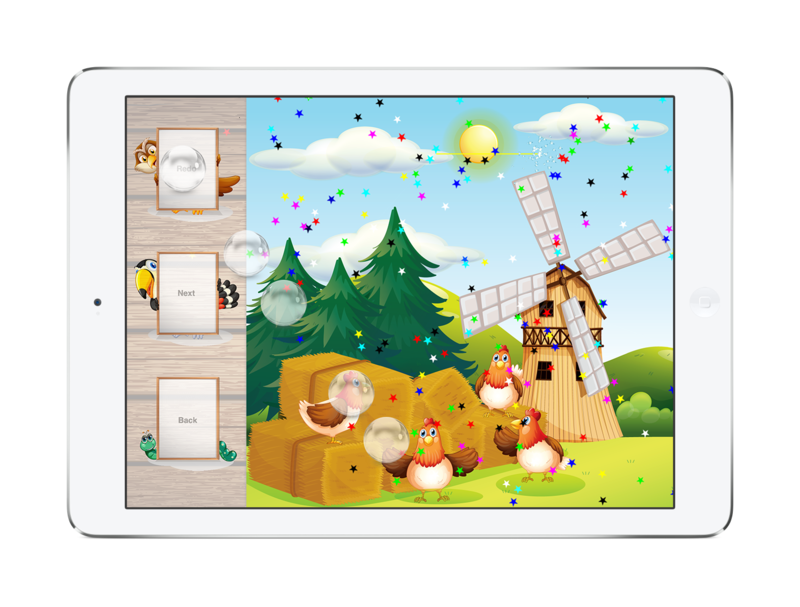 The Toddlers Puzzle released last week is available only for iPad at the moment. 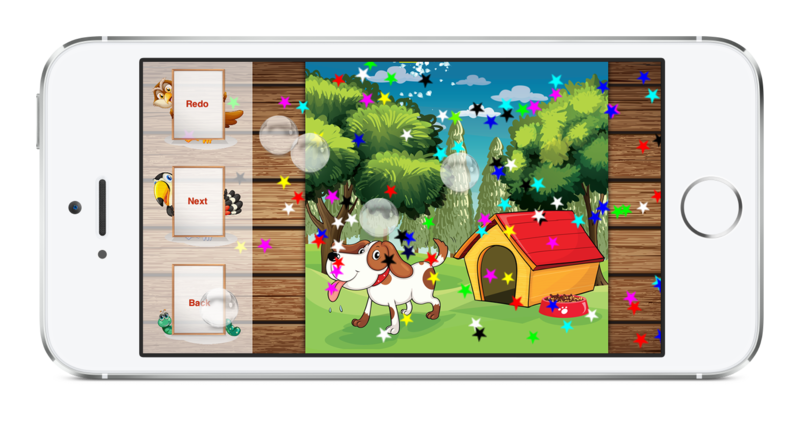 We are currently working on the iPhone version and a new update for the iPad one. We will include in there more fun and a few surprises. 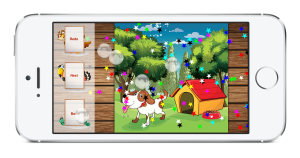 We are proudly announcing the release of our first, brand new Toddlers Puzzle game for iPad. All the toddlers in our environment influenced us to build something for them: a game, which is easy to use, not overcomplicated with levels, points or crowded with aggressive advertisements for other games. We wanted a simple, yet fun game. That’s how the Toddlers Puzzle was born. Solving a puzzle is a good way to improve memory and visualisation skills. 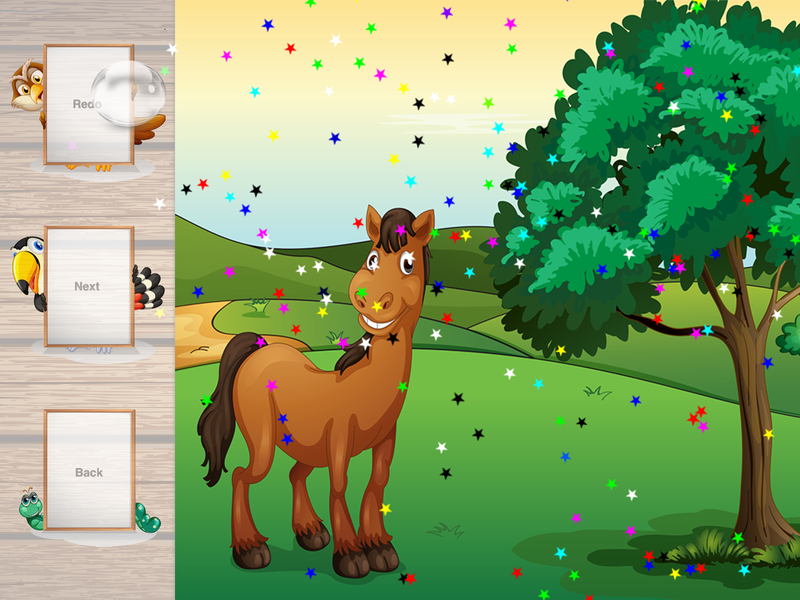 This game was specifically created for the inpatient toddlers, so they don’t have to bother with the jigsaw pattern. 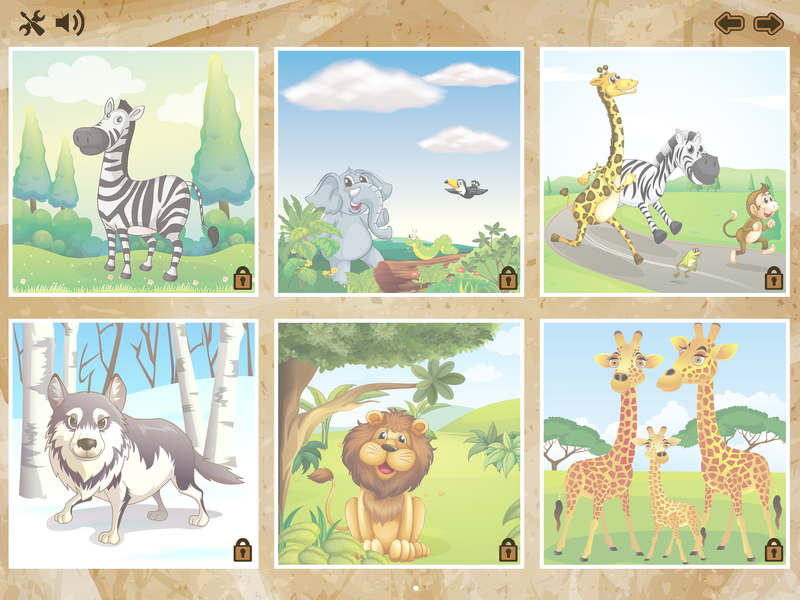 Our puzzle pieces are in general bigger, having fine and straight endings which makes them easier to match. 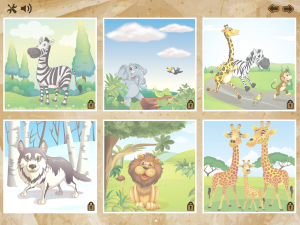 We collected the pictures for the puzzles in a careful way, so that your toddlers can really enjoy matching and laying the puzzle pieces into the base picture. In the current version of the app, there are 5 ways the base picture can be cut, and this happens randomly, when you load a new picture. 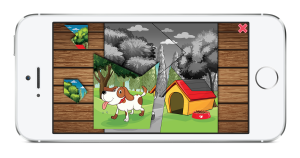 Currently the app contains 4 piece puzzles, but wait for more to come. We wanted to make the game more enjoyable, that is why the rain drops show up every time a piece is put in it’s right place. These rain drops can be popped for the amusement of your toddler. This is some kind of recognition for their success and also represents a motivational element to find the right place for the right piece. 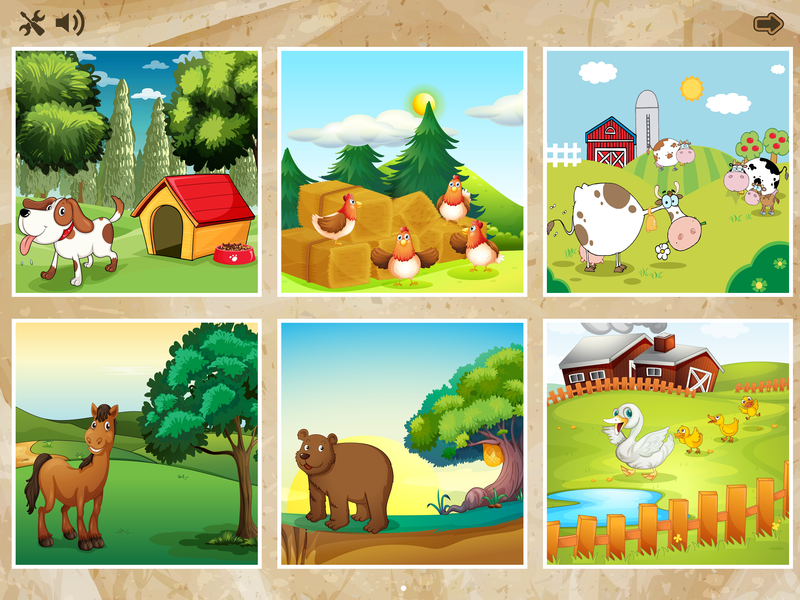 The music which plays when a puzzle is being solved was carefully chosen from a series of children music. It is really touchy, but not annoying at all. As for me, I like just listening to it till the end. When the puzzle is solved and all pieces are in place, little stars fall down and your toddler gets a big hooray as a recognition for the good work. 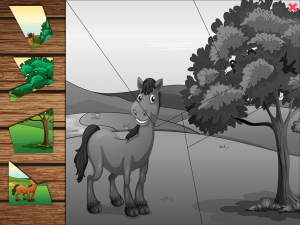 At the setting page the difficulty of the puzzles can be set. 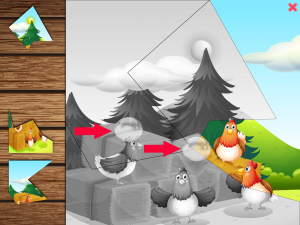 Easy means that the greyed out picture of the ready puzzle is shown. When medium difficulty is chosen, then just the outline of the puzzle pieces can be seen. Hard means you are on your own with the pieces on the board. On this page we expect your feedback to us on improvements, suggestions. 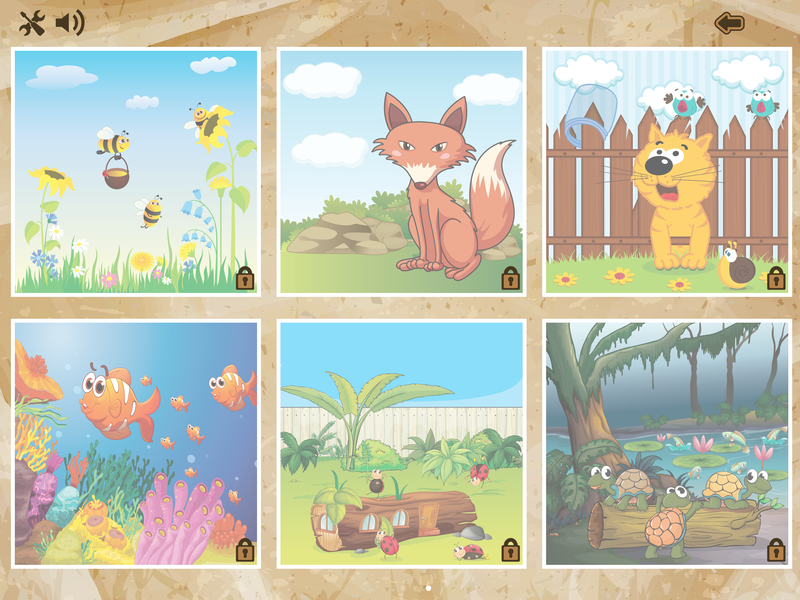 If your toddler gets bored of the first 6 free pictures, there are two in-app purchases, each containing 6 more. But don’t worry, parental gate is taking care of your account.